Are you trying to find out how to make meal tickets for a fundraiser? There are several ways to do it yourself and save your organization money while keeping the event organized and running smoothly. A fundraising dinner event can raise a large amount of money for your organization. However, this type of event requires significant advance planning work and organization to be successful. Basic planning components include sending out invitations, creating an admission ticket to the fundraiser and incorporating other fundraising elements into the event. Fundraising dinner events can include various elements such as entertainment and a silent auction. The dinner itself may be a sit-down affair or may be a more casual event where guests can either dine-in or take-out food. Either way, some type of meal ticket will need to be created so that the event can be run in an orderly manner and guests can be tracked as they pay for the meal. When planning your fundraising dinner event, you can cut down on expenses by creating the meal ticket yourself instead of paying an outside source to do it for you. The process is simple if you have a word processing program on your computer as well as some basic supplies. To create the ticket, use a program such as Microsoft Word and enter your information into the document. Once the document is set up with all your information, print a copy to see how it looks. After you have it the way you like, you can make copies at your office or have them made for you at a local printers. Choose a paper that is sturdy and in the theme colors of your event. If your event is to support breast cancer awareness, a ticket printed on pink paper can add a special touch. For fundraisers that have meals that can taken out, a simple ticket that indicates the meal choice and that it is paid for is all you need. A slip of paper with the food item purchased can be created and handed to each guest as they pay for the meal. Once the item is ready for pick up, the guest can turn it in and leave with their meal. Some type of meal events, such as a taste test fundraiser, may require no more than a meal ticket that states "admit one". 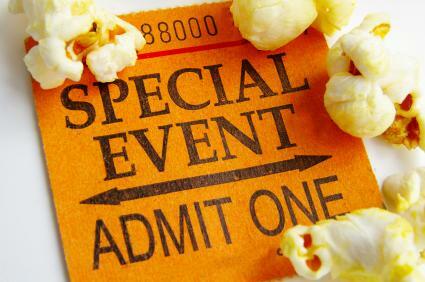 The ticket can either be purchased in advance or at the door and handed in once the guest enters the festivities. For those who do not want to use a meal ticket, there are a few options. Consider creating a guest list and designating what each guest will be having for dinner. The guest list itself can also serve as a meal ticket. If the event is invite-only, the guest list can be used to check off names as guests arrive. For those who paid in advance, mark that on the guest list as well as those who will be paying at the door. If there is only one option then there is no reason to create a special ticket for entry or meal selection. If if you are giving guests a choice regarding what to eat, you can use place card stickers to designate orders. If you use this option, attach a sticker in a specific color to each place card to designate the meal choice. For example, use red for a beef dish and blue for a fish entrée. Be sure to tell the servers what each color means so that there is no confusion when delivering the meals. Meal tickets used at a fundraising event are a great way to keep the event organized and guests fed accordingly. Meal tickets can either be mailed to each guest in advance of the event or handed out to each guest as they arrive. For more ideas, check with other local organizations to see what has worked best for their specific dinner event. Remember there is no set rule on what a meal ticket should look like. Tailor it to your event and use what works best for your organization's specific needs.